, Nicol said messaging apps provide a “once in a generation” opportunity to culture and develop a new channel that facilitates one-to-one conversations. Nicol refers to On Message’s offering as “conversation marketing”. “It’s about clearing our brain of what marketers previously knew about broadcasting, to think differently about how we engage with people,” Nicol said. 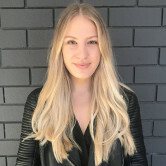 At the event, held at Sydney’s The Establishment last night, On Message unveiled an emoji analytics tracker, and announced its work for its first client Jim Beam. Nicol believes emojis are an important feature of the Australian language, with 31 billion emojis to be sent by 2016. “Our emoji tracker will help brands understand the use of emojis, the psychology behind which ones they use and how brands can get better at using them,” Nicol said. For its work with the bourbon brand, On Message produced a geo targeted Facebook Messenger bot as part of a taste challenge campaign. It offered fast and convenient information to consumers on their closest in-store promotion, available nationally across 700 stores. The startup has also secured a pharmaceutical company as a major client, planning to launch a bot for mothers in coming weeks. Nicol also announced On Message will be working with Snaps, a platform for advertisers to connect with consumers through branded emojis. Snaps currently works with clients including Dove, Coca-Cola, MTV and Burger King out of the US. The startup concept was developed by Nicol, Damian Pincus and Kevin Macmillan, with Australia reporting a revolutionary increase in the use of messenger-based apps such as Snapchat, WhatsApp and Facebook Messenger. 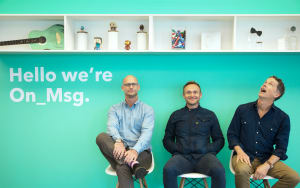 The Works founders Damian Pincus, Kevin Macmillan and Douglas Nicol. Messaging apps have taken over traditional social platforms in monthly users and could hold the future of marketing, The Works founder Douglas Nicol said. Speaking at the launch party for The Works’ new messenger-based social media company, On Message, Nicol said messaging apps provide a “once in a generation” opportunity to culture and develop a new channel that facilitates one-to-one conversations.